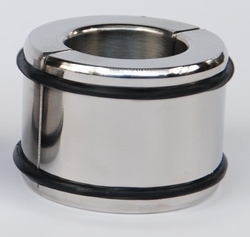 This highly polished stainless steel ball stretcher consist of two halves that can be connected by two rubber rings. It is very fast to put on or off. By its weight there is a continually sexual sensation. The finish is perfect and is nicely rounded. Available in small steps of only 3 mm of inner diameter. Made from high grade stainless steel.